Tommy Mac stopped by to say hello. Photo by Roger Myers. The last day of The Furniture Project at the New England Home Show was pretty busy again, despite the rainy snowy mix outside. I didn't have anyone pre-registered for my classes, so I ran the day as an open demo, demonstrating things as people stopped to watch and talk. While Tommy MacDonald, star of the PBS show Rough Cut, wasn't officially affiliated with the event this year, I really have to thank him. He was the one who got it going three years ago and opened it up to the rest of us. I spoke to dozens of people about class schedules and topics over the four days, and handed out over a hundred business cards. I expect to have my schedule for this year posted in the next couple of weeks, so keep an eye here for that. In the meantime, you can see what I offered last year; this year's group classes will be the same, just different dates. And of course you always have the option of private classes or classes at your location. I've also started teaching classes at the Boston Woodcraft store. 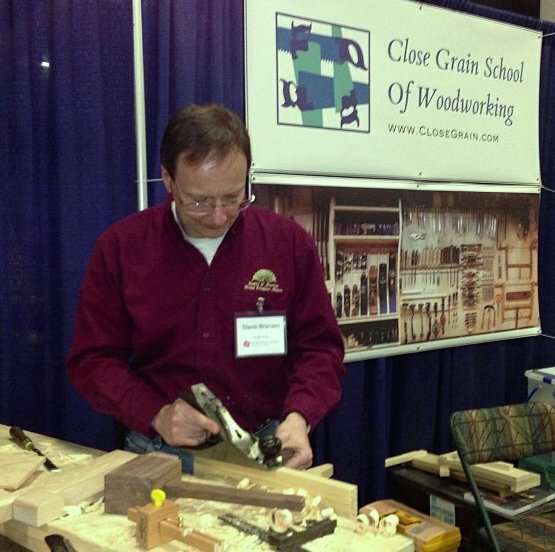 I have a mortise and tenon class scheduled there March 9. 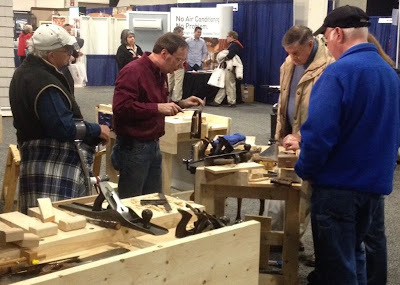 Demonstrating saw sharpening to several onlookers. Photo by The Furniture Project. 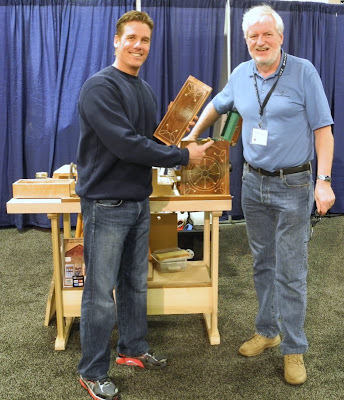 Fellow Furniture Project exhibitor David Yepez brought in a saw from out in his truck that he had bought at Roy Underhill's school for a quick lesson. He's an experienced edge sharpener but not an experienced saw sharpener. 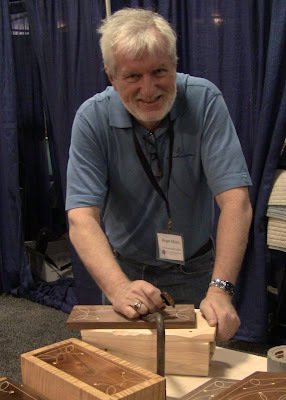 It was lightly fleamed, so I showed him the process for sharpening a crosscut saw, and he took it from there. He put a higher fleam angle on it just to see what it would be like. After quickly scribbling on each side with a block of wax, he was very happy with the improvement in cutting speed. But it was rougher than he liked; he said he had noticed before how a freshly sharpened saw took some use to smooth it out. I stoned it with just a few light passes of a coarse India slipstone along each side to clean the burr off the teeth, and that did the trick. It cut fast and smooth. Planing an edge with a smoother. Photo by Scott Oja. I got a lot of comments on the tool wall photo on my banner. People really like that picture, between the array of tools on display and their organization. Several even took pictures of it. This is the photo on my banner that everyone loved. One of the tricky parts about shows and demos is deciding what to bring. Sometimes you have to improvise. Roger Myers was back demonstrating stringing inlay, and found that the bench he was using was just a little too low for his comfort. He has a really nice bench raiser with Benchrafted Moxon vise and tail vise, but it's fairly heavy, so he didn't bring it. He said he just needed a little elevation, so I took 30 seconds to screw a scrap from the sawing classes to the edges of a couple pieces of 2x4 with drywall screws. It worked so well for him that at the end of the day he said I had to include it on the blog. Now that the show is over it's for sale for $100, shipping included. Roger using my supah-dupah bench raiser for his inlay work. Tommy showing off some of Roger's work. 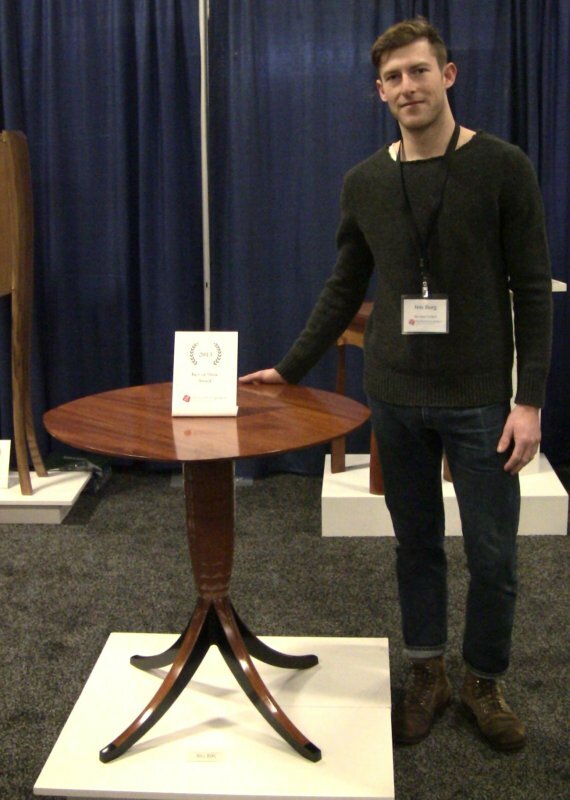 The Furniture Project organizers handed out several awards for the pieces on display. Nils Berg took home two awards, Best In Show and Most Creative. One of my goals was to get photos of all the work on exhibit and post links for all the furniture makers. They're all current or aspiring professionals producing excellent work, so if you're interested in custom furniture, consider contacting them. Many have portfolios on their websites if you want to see more of their work. I didn't quite get everybody. I know that I missed at least Rob Bois, and possibly some of the North Bennet St. School students. I'll update this post as I get their names. Nils Berg receives Best In Show from organizers Scott Oja, Justin DiPalma, Eli Cleveland, and Rick Waters, with Bruce Wang watching. ...and his Most Creative cabinet-on-stand. 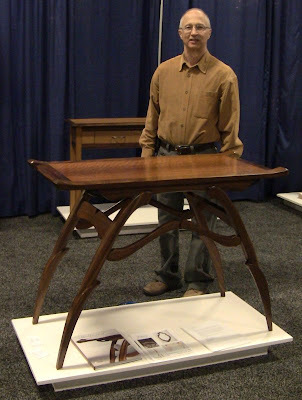 Lars Larsen with his writing table and demilune table. Lars builds beautiful contemporary furniture. He showed me the drawers fitted into the ends of his writing table, and they were like fine furniture on their own. 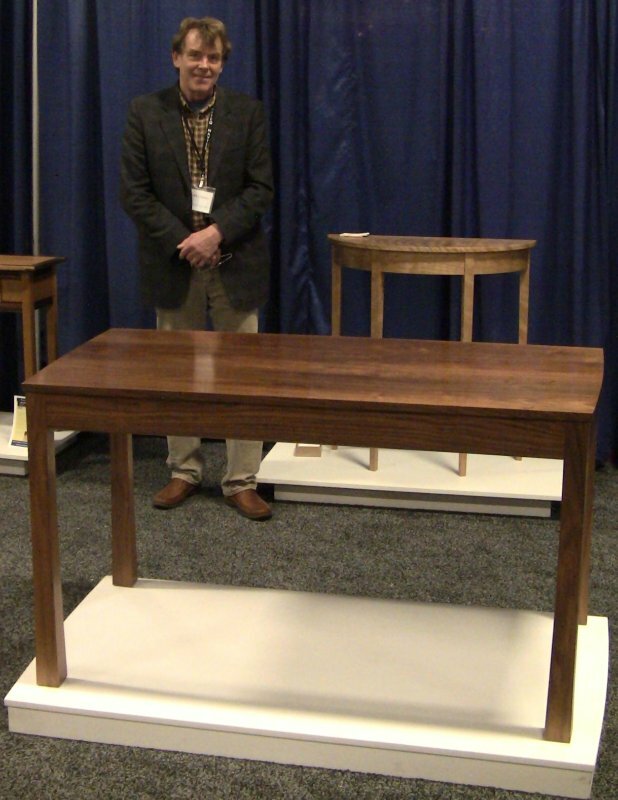 Mike Fossey with his work from the Furniture Institute of Massachusetts. Kevin Mack with tables and seating. 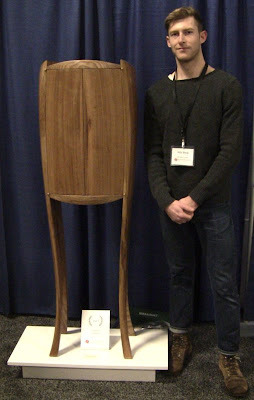 Kevin was a previous winner of Best In Show in Providence, RI. 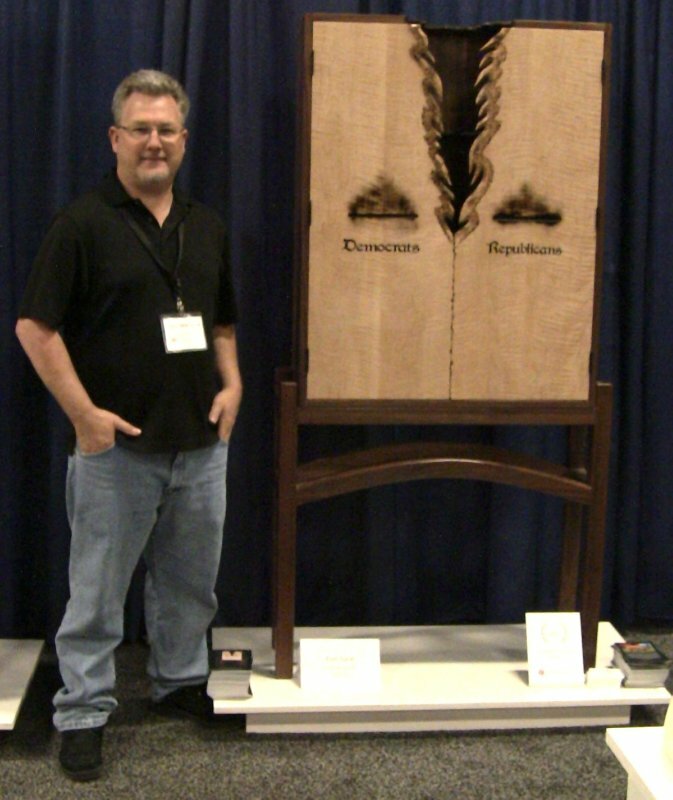 Sean McKenzie and his "Voting Booth" cabinet-on-stand, winner of Best Interpretive Category. I told Sean it looked the booth would snag your hand on the barbed edges if you tried to reach in for the ballots. He said someone else had the same idea; his concept is that the electoral process is tearing itself apart. Glen Guarino with his table. 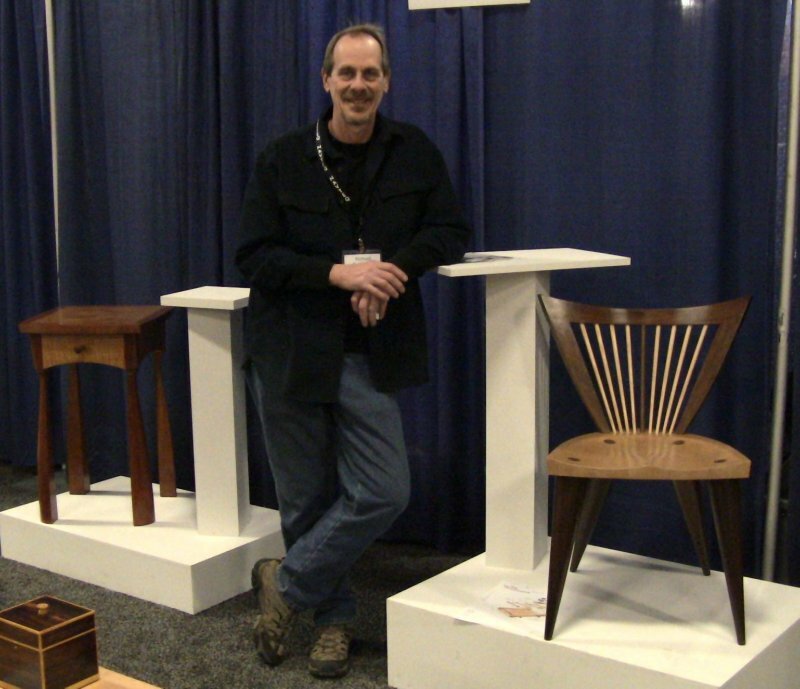 Glen is a master of sculptural shaping in his furniture. 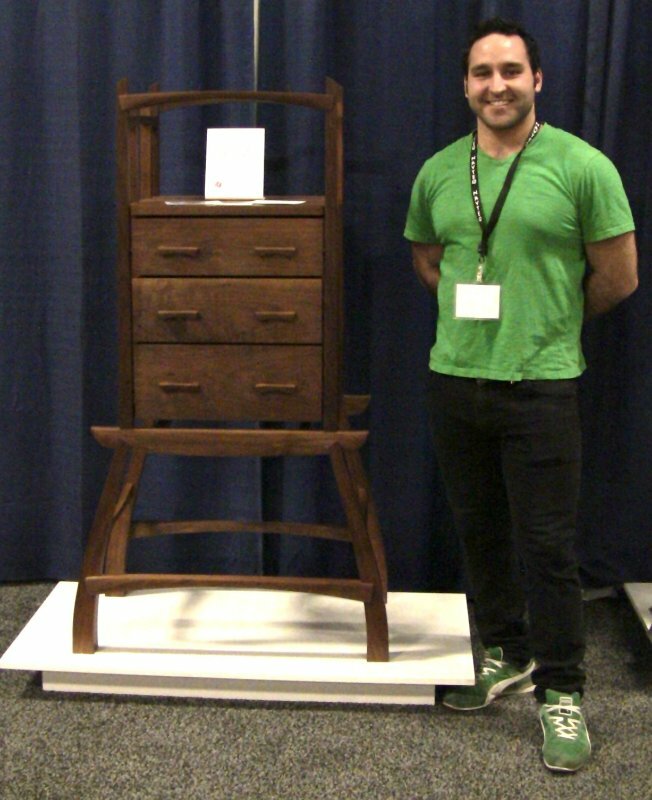 Matthew Mullen's beautiful cabinet-on-stand took the People's Choice Award. In addition to his cabinet, Matthew had a contemporary side table and also sold a chair at the show. 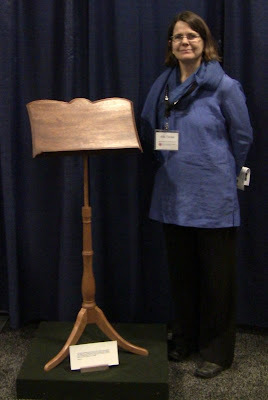 Alta Tarla with her music stand. 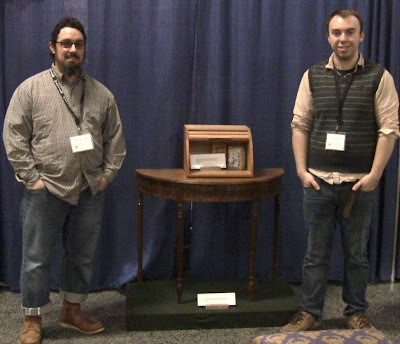 Gus Lammers and Evan Court with Gus' demilune table. Alta's breadbox is on top. Gus' table won Best In Show Student at the Providence Fine Furnishings Shows. 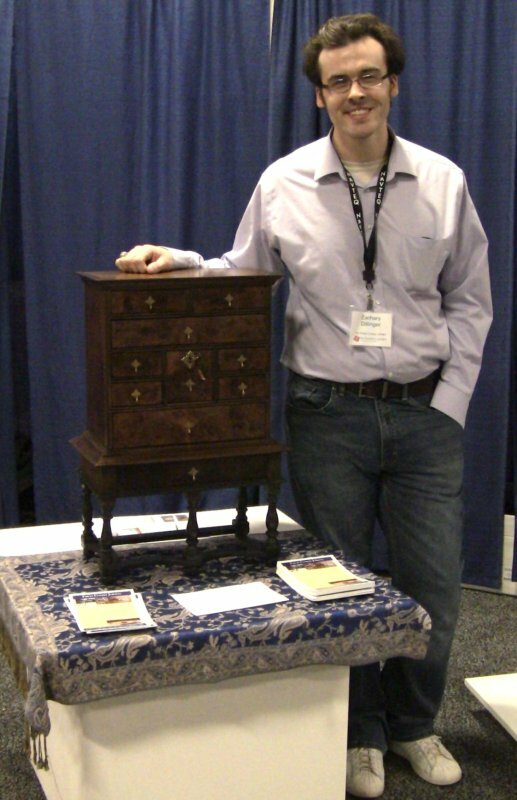 Zach Dillinger with his William and Mary spice chest. Zach's spice chest will be the cover story in an upcoming issue of Popular Woodworking Magazine. 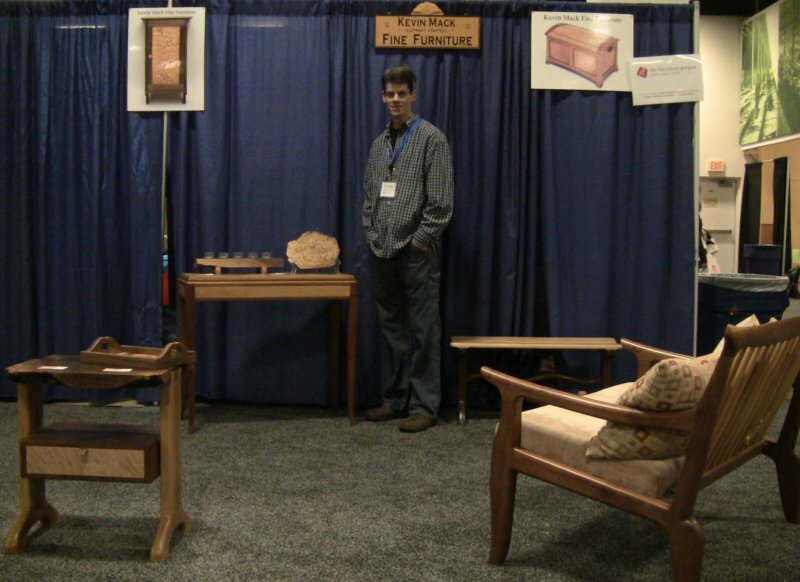 Richard Townsend with his New Windsor chair and side table. 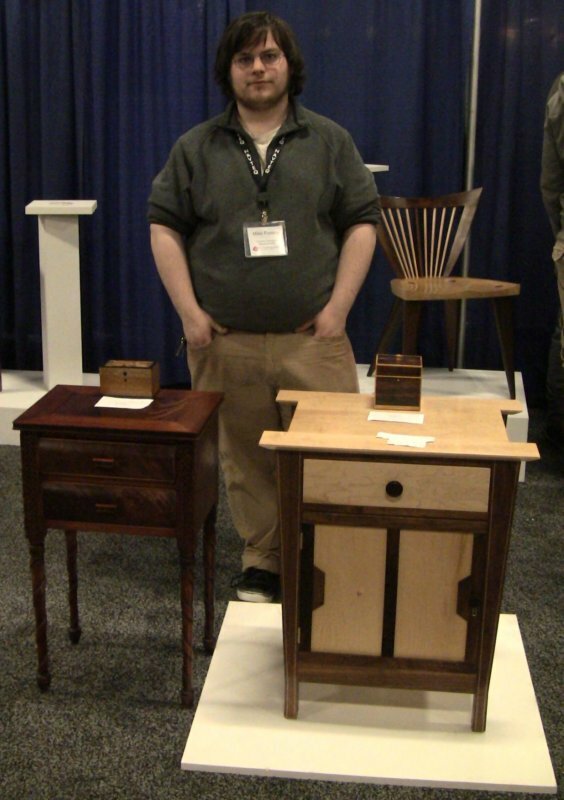 In addition to building new furniture, Richard does furniture restoration. 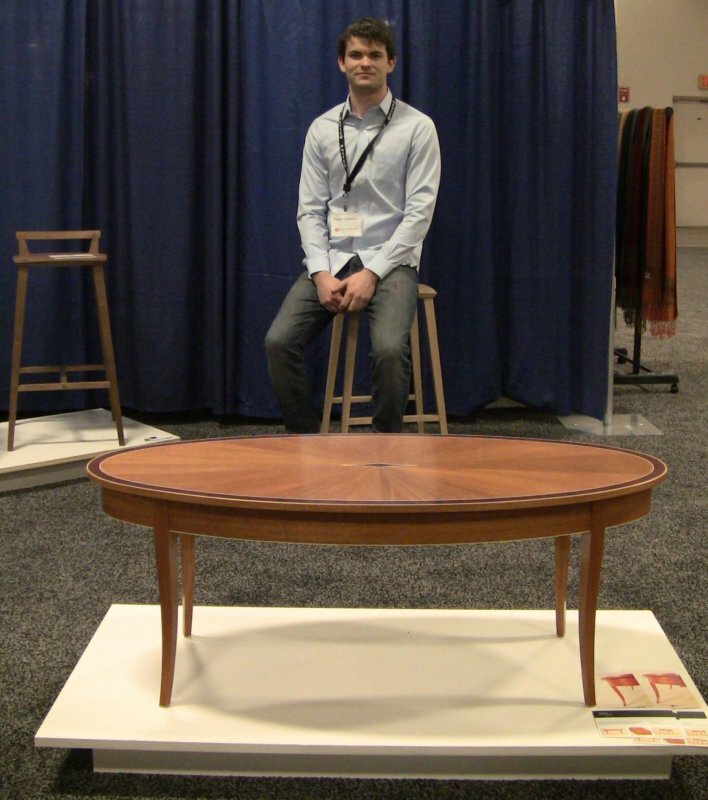 Peter Coolican with his Ellipse Table and stools. Peter's elegant table is beautifully veneered, featuring a radial veneer match on the top. Chris Boule with his quilted maple veneered mahogany highboy, winner of Best Craftsmanship. 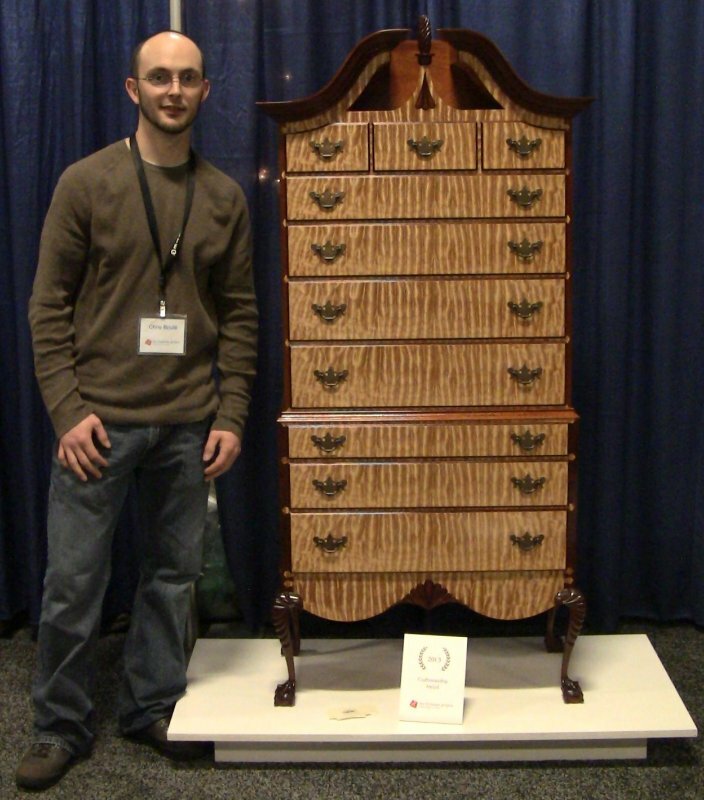 The quilted maple on Chris' highboy was stunning, dramatically contrasting with the mahogany. The legs have tiny ball and claw feet and knees like the carapace of a crustacean. Sten Havumaki demonstrating a leaf carving. Sten's carvings were fantastic, with exquisite 3-dimensional details. He made it look so easy. I didn't get much chance to get around to the rest of the show, but there were a couple of exhibitors I wanted to mention. 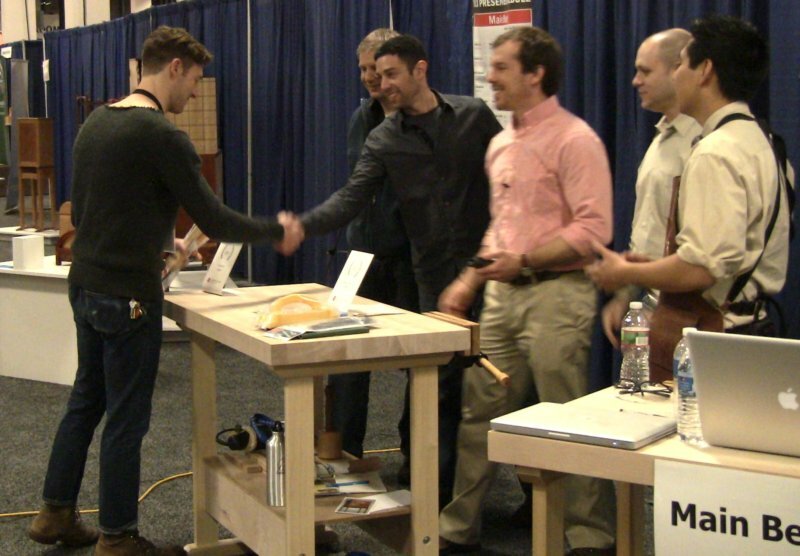 The first one was the Eastern Massachusetts chapter of NARI, the National Association of the Remodeling Industry. Gary, one of the gentlemen manning their booth, stopped by a couple times to watch and chat (he's one of several construction professionals who have expressed interest in my classes recently). He mentioned that he was just there to educate the public, not sell anything, and I thought his message was worth getting out. NARI provides a certification process for remodeling contractors. Their focus is on professional conduct, continuing education and training, and fair and ethical treatment to protect homeowners. 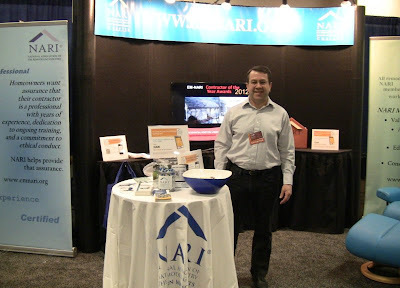 Stephen Doucet, president of the Eastern Massachusetts chapter of NARI. The second was Commonwealth Quality, a brand designed by the Massachusetts Department of Agricultural Resources to identify locally sourced products that are grown, harvested and processed in Massachusetts, using practices that are safe, sustainable and don’t harm the environment. I'm a big proponent of supporting local businesses. 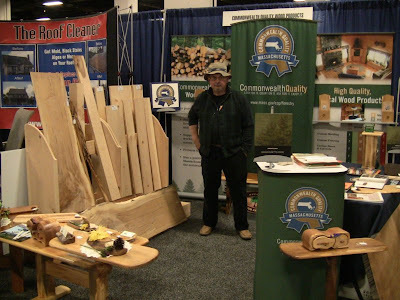 The booth at the show emphasized wood products from participants Specialty Wood Products, Gurney's Sawmill, Berkshire Hardwoods, Copper Beech Millwork, Forestry Works, Hall Tavern Farm, Heyes Forest Products, Lashway Lumber, Ponders Hollow, Roberts Brothers Lumber, and W.R. Robinson Lumber. 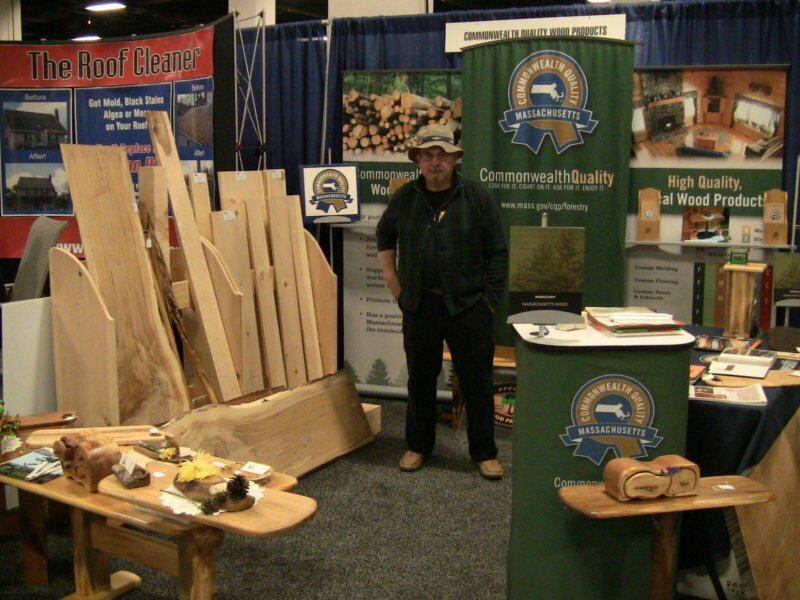 Fred Jajko of Specialty Wood Products manning the Commonwealth Quality booth. 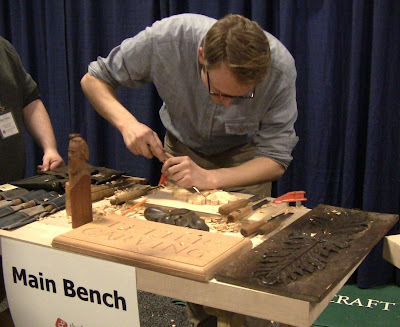 Once the show closed, I spent an hour and a half dismounting the vises, disassembling the breakdown bench, and packing up with the help of the other Furniture Project participants. I was beat after 4 days on my feet, but I had a blast! A friend of mine who's done a number of trade shows told me it's not the business you do at the show that really counts, it's the residuals that come in weeks, months, even years later as people follow up or remember you. If you put in the effort to get out and engage people, you start the business pipeline. 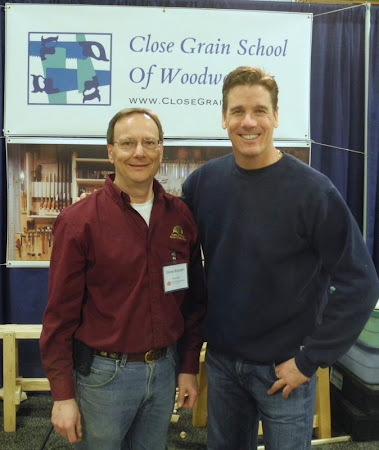 Thanks for a great writeup Steve! It was a pleasure to meet you. Keep up the great work! !